Burgundy kale, garlic chive flowers and peppers. It has been a great summer for salads. We have been eating a large fresh salad every day for months. It started with spinach, lettuce and rainbow chard leaves from last year’s fall garden that overwintered. I even picked spinach on Valentine’s Day. Early in the spring we planted more lettuce, curly and burgundy kale, carrots and large leaf basil indoors(in late February) that we were picking for salads before it was warm enough to plant that basil outside. When the lettuce and spinach was done by early summer, we continued with kales, chard leaves, carrot greens, basil and garlic chive leaves. 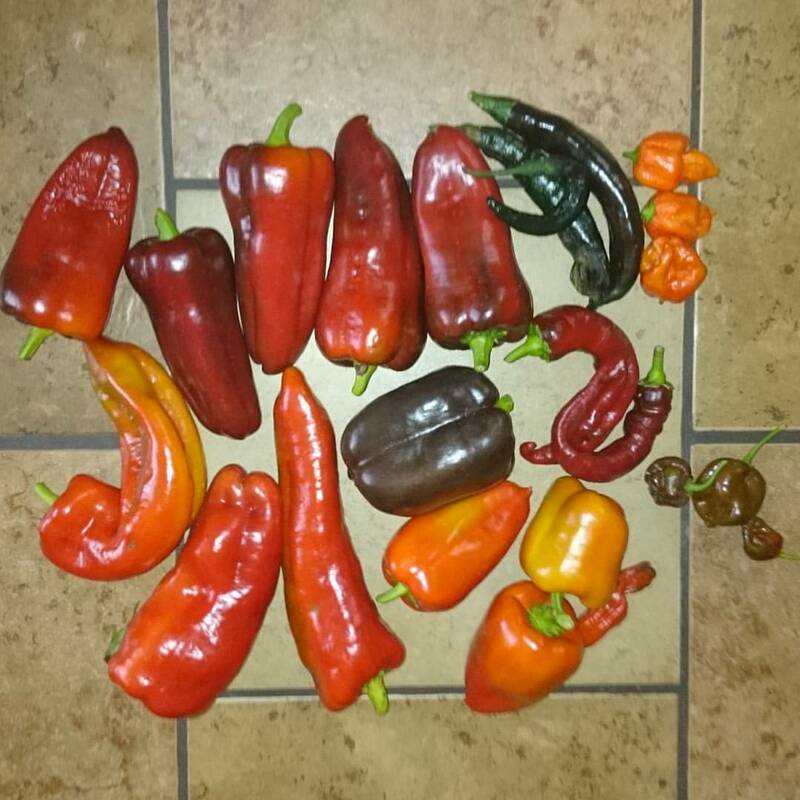 By midsummer, we were adding grated carrots and ripe tomatoes, starting with heirloom cocktail varieties that ripen early and peppers, especially the varieties that ripen early like Gypsy and Jimmy Nardello. By late summer we were adding tomatillos and a large variety of ripe peppers including a new favorite, Chocolate bell. A couple of larger varieties we like that ripen earlier than bells are Aconcagua and Giant Marconi. Not only are they delicious raw in salads, but when they ripened in quantity, we stuffed some of them with a mixture of onions, garlic, herbs, nuts and shrimp mixed into a soft cheese and baked them in the oven. One of my favorite dinners with, of course, a large salad on the side. 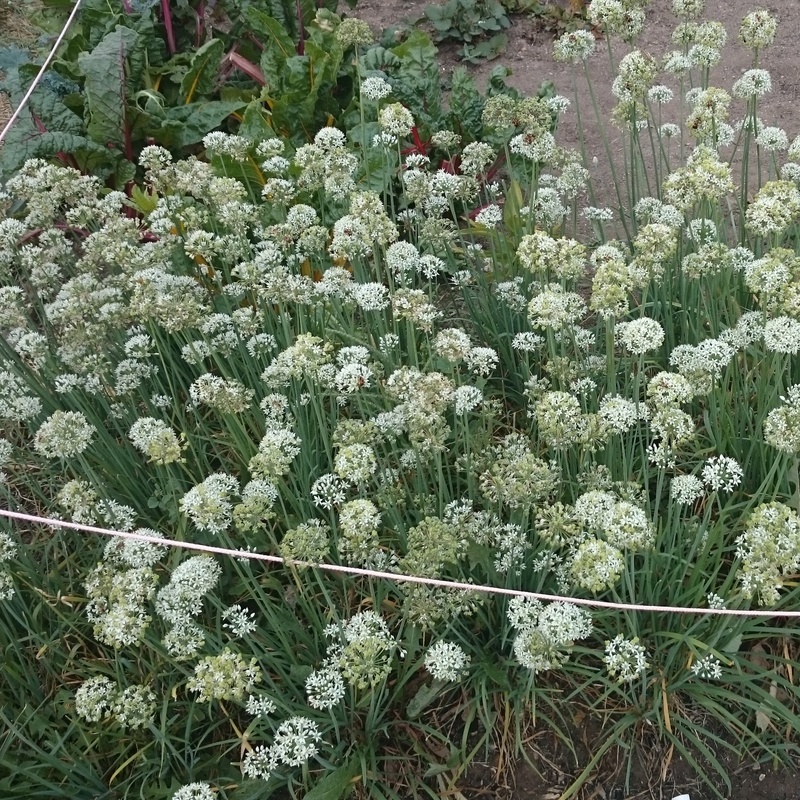 A bonus in late summer was the flowers from garlic chives. Garlicky yet sweet, they are delightful sprinkled on top of a salad. We even sautéed garlic chive flower buds with shishito peppers as an appetizer. As someone who doesn’t like vinegar or ranch dressings, it has always been hard for me to find any salad dressing I can enjoy. We had been using an organic tomato-based dressing that was okay when my wife Cathy decided she could do better. She started making our own dressing in the blender using fresh tomatoes as a base but also adding onions, garlic, various peppers, tomatillos and herbs, adding a fresh mix every time the dressing container got low. With a little sea salt and olive oil added after blending, we’ve discovered a thick, fresh tomato-tasting dressing that is superior to any other dressing we have ever tasted. We also enjoy sprinkling some grated cheese over our salads and have even added grated parmesan to the dressing sometimes. In the first week of August, we planted a fall cool season crop of lettuce, spinach and edible-pod peas. We were already picking spinach by late September. 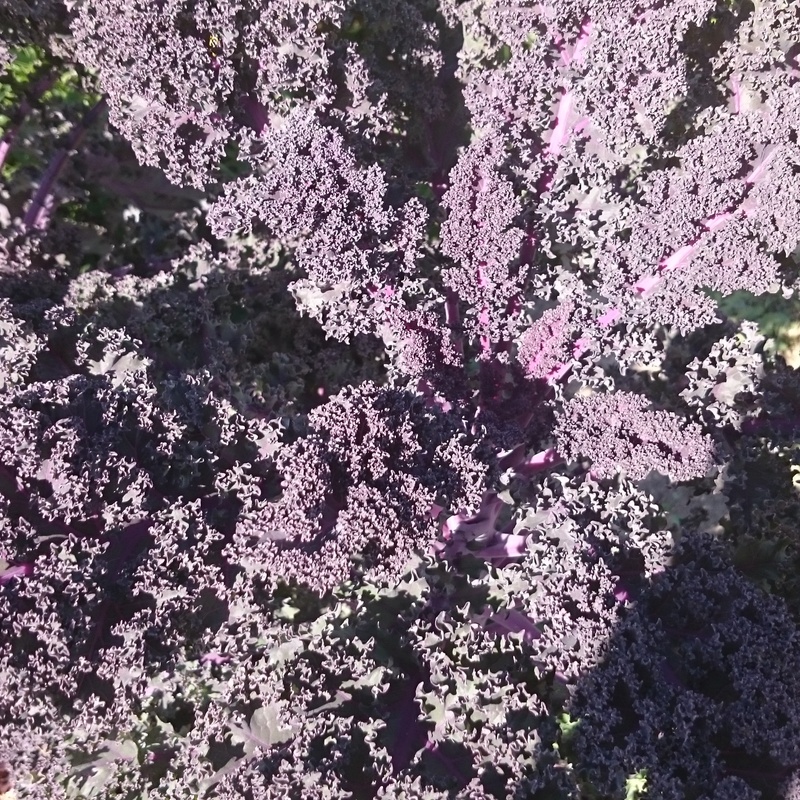 Here in the first week of October, we hope to continue our fresh salads for a couple months with those crops as well as the kale, rainbow chard, grated carrots and garlic chives which will tolerate cold temperatures below freezing until we hit very cold winter temps. I’m also about to start basil indoors to grow in the bright south-facing window in my office that should give us fresh basil until well after the fall garden freezes. This has easily been the best summer of salads I’ve ever experienced.